CEE-LINE™ brings hydrographic-grade performance to bathymetry projects using land survey data acquisition. Indestructible with exceptional sounding consistency, simply connect the CEE-LINE™ to a data collector, tablet or PC for accurate and trustworthy results. The CEE-LINE™ represents a next generation approach to GNSS pole-mounted bathymetry surveys. 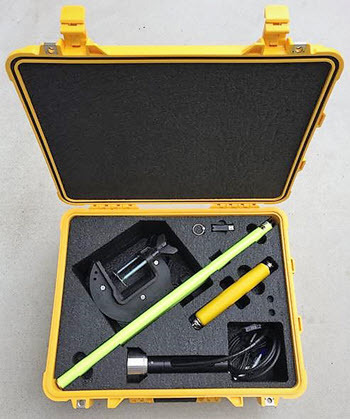 With an indestructible construction and a no-nonsense USB power cable connection to the acquisition data collector, tablet or PC the CEE-LINE™ is a survey-grade echo sounder designed for maximum reliability and exceptional bottom tracking. With no internal battery to worry about, the CEE-LINE™ is always ready to start surveying. Containing a super-fast modern processor running advanced bottom tracking algorithms, the CEE LINE™ keeps a solid lock on the bottom even in extremely shallow water. With a ping rate up to 10Hz and two frequency channels 33 kHz and 200 kHz available, the CEE LINE™ may equally be used with dedicated hydrographic acquisition software or with GNSS topographic acquisition utilities. The CEE-LINE™ echo sounder uses a 2016 generation small form factor processor to run complex bottom tracking algorithms while maintaining a high ping rate, maintaining a rock-steady lock on the “real” bottom and ignoring fake signals such as double reflections and unwanted noise. With flexibility to use several different transducers and even operate in dual frequency 33/200 kHz mode, the CEE-LINE™ is a true hydrographic survey quality performer whether used with a GNSS data collector or with an acquisition PC running HYPACK®. All CEE echo sounders use hydrographic survey-grade analog transducers, including the CEE-LINE™. This means the depth sounder calculations are performed in the CEE-LINE™ processor module and not in the transducer itself as happens in so called “smart” echo sounders. The CEE-LINE™ is designed to operate with hand controllers using either a USB or COM port interface. 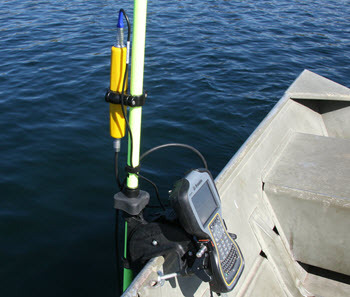 Simply plug the data / power cable into the acquisition device and bring in the echo sounder depth data. The CEE-LINE™ outputs several formats for trouble-free integration into GNSS continuous topo data recording. The CEE-LINE™ can be used with practically all GNSS data collection equipment. Whether you are replacing an existing pole-mounted echo sounder or introducing a new hydrographic capability for inshore bathymetric surveys, the CEE-LINE™ can be trusted to work seamlessly with common acquisition utilities such as Trimble Survey Controller, Trimble Access, Carlson SurvCE, Topcon MAGNET Field, and Leica Viva. The CEE-LINE™ continuously streams accurate depth data every tenth of a second, ready to be incorporated into the GNSS topographic dataset as a modified point elevation. The USB smart cable offers a simple and reliable data and power interface with the CEE-LINE™. No need to worry about charging batteries or dealing with potentially troublesome Bluetooth interface settings, or having to use a potentially unreliable wireless connection. Every time the CEE-LINE™ is plugged in, it is ready to start work. With a low power draw – especially working in shallow water – battery run time on a connected data collector will not decrease excessively even with the acquisition device powering the CEE-LINE™. Manufactured to exceptional quality standards with an encapsulated processor core and an over-molded jacket the CEE-LINE™ will withstand years of field work plus more extreme abuse. 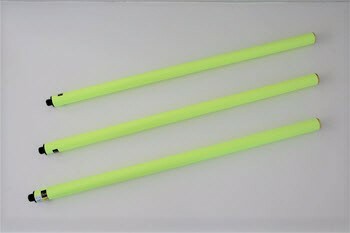 Even complete immersion under water or a 6ft+ drop on concrete will have no effect on the CEE-LINE™ operation. 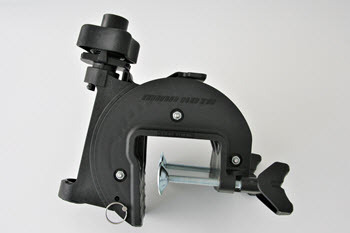 Don’t introduce a weak link in your survey equipment – choose the CEE-LINE­™. 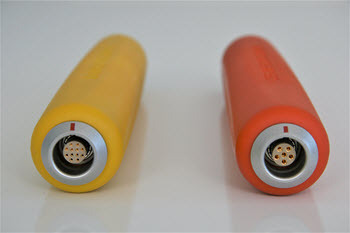 By reducing the connections to just two waterproof LEMO plugs (transducer, and power / data) the CEE-LINE™ has no weak points, less to go wrong, and nothing to break off. 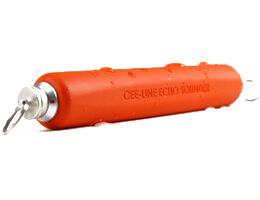 The CEE-LINE™ echo sounder is supplied with a USB power / data cable compatible with a PC, tablet, or data collector. Two transducer options are available separately – 3 degree narrow beamwidth or 9 degree standard beamwidth. The optional RS232 DB9 cable with a flying lead for DC or USB power allows the CEE-LINE™ to connect using a standard COM port interface. 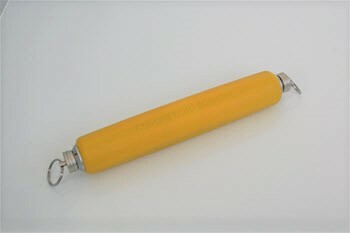 NOTE: Previous generation CEEDUCER™ and CEEDUCER PRO™ transducers are not compatible with the CEE-LINE™. The CEE-LINE™ is available as a two-channel echo sounder that may be used for surveying in regions with poorly consolidated or disturbed sediment where a 200 kHz-only echo sounder might be inadequate. Using the compact M195 transducer,the CEE-LINE™ offers a lightweight and portable dual frequency system. The CEE-LINE™ advanced power management automatically adjusts the ping rate to ensure enough ping energy is available to track the bottom. Existing 200 kHz-only units may be upgraded to dual frequency with a simple field firmware update. For convenient installation on small boats, the 200 kHz CEE-LINE™ echo sounder is available in a surveying kit with custom brackets and mounting hardware. Everything needed to start hydrographic surveys with a data collector, tablet, or PC is included in the waterproof Pelican 1560 roller case. See the CEE-LINE KIT kit tab in the product information table below for details. Watch California-based land survey firm GIS Surveyors Inc conduct a small lake survey using the CEE-LINE™ echo sounder and Trimble TSC3 data collector with Trimble R10 GNSS from their motorized kayak. Several data output formats are available on the CEE-LINE™ allowing depth data to be brought into GNSS measurements to record a final bottom elevation. Well-established Trimble configuration options are easily added to the data collector in order to start work with the CEE-LINE™. The USB port or DB9 COM port may be used as desired, with the CEE HydroSystems “Smart USB” cable handling data and power in one. Using a field tablet PC further enhances the bathymetric data collection process using the CEE-LINE™, enabling the simultaneous CEE-LINE CONNECT software to fine-tune the echo sounder sonic characteristics. Learn how to use the CEE LINE™ with the Trimble TSC3 data collector in the Trimble Access environment and the Geometius BathySurvey hydrographic App. Monitor and modify the operation of the CEE-LINE™ echo sounder on the fly with the CEE-LINE CONNECT utility. Adjust bottom tracking and sonic characteristics, maximum depth and sound velocity for a resilient hydrographic solution. – Is it really indestructible? Nothing is indestructible. But this is as close as you can get with an echo sounder. – What is the maximum depth achievable? 100m with either 33 kHz or 200 kHz frequencies. – How do I connect the CEE-LINE™? 1. SMART USB. Single cable providing power and data connection. 2. SPLIT RS232 FLYING LEAD. 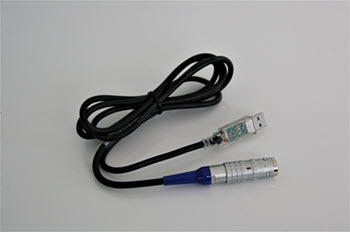 Y power / data cable terminates in a standard serial DB9 connector for data and a pigtail DC power cable. – How is it powered? Use any 12-24V DC supply or 5V USB. – What is the data output? The CEE-LINE™ can output common formats data such as DESO25, Odom SBT / DBT, NMEA0183, Sonarmite old, Sonarmite new. – How is the echo sounder operated? Just plug in and it starts pinging. The CEE-LINE™ is designed to need a minimum of adjustment. – Do I need an acquisition device? Yes. The CEE-LINE™ does not log data. – Can I use my existing analog transducer? Possibly. We can supply patch cables for some connector types. – Can I change the settings if needed? Yes. Using the CEE-LINE CONNECT interface software portal or BathySurvey App for Trimble. – Can I enter sound velocity (SV)? Yes. This is entered using the software portal. – Is there a Bluetooth data output? No. The CEE-LINE™ is designed for cabled operation. – Can the CEE-LINE™ be used with CEEDUCER™ and CEEDUCER PRO™ echo sounders? Yes. The CEE LINE™ can replace and upgrade the smart transducers used on the legacy CEE HydroSystems echo sounders. The output of the CEE-LINE™ is connected to the transducer input of the control box. 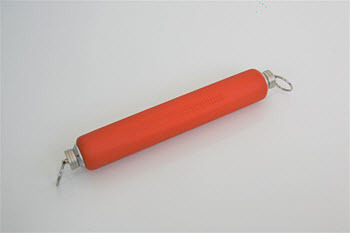 The CEE-LINE™ CANNOT be used with CEEDUCER™ transducers. – Can the CEE-LINE™ take in GPS? No. The CEE-LINE™ is a standalone echo sounder.